There's nothing better than eating freshly picked food in season--except when you trick the seasons and extend your harvest. Thanks to floating row covers, heavy clear plastic, and some old bedsheets, we're still enjoying all kinds of gorgeous and tasty organic salad greens. 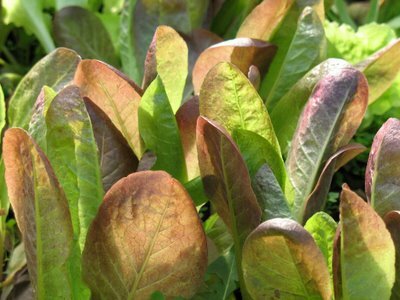 (Click here to learn how you can go from seed to salad bowl in less than a month--no matter where you live.) Of course even the loveliest, most delicious lettuces pale in comparison to the star of Saturday night's dinner--fresh, tender venison on the opening day of deer season. I was out in the field with the sheep and managed to bag two bucks armed with nothing more than my shepherd's crook and Cary's baby bottle. Now that's country living! Ooooooh. That looks delicious. Now where's my salad dressing? Two bucks with a shepherd's crook? How the heck...?! Three cheers for out-of-season gardening! I made the Dill-Cheddar Beer Bread last night, FG, and it was awesome. Thanks as always for your great blog and recipes! I'm with Trish... how the heck?? Obviously we are confused - eating bucks bagged with a shepherd's crook? I echo Trish and Juliar - what the heck??? You bonked them to death with the shepherd's crook? Crook, how'd you do that? My son hunts deer with a bow and arrow which is difficult enough, but a shepherd's crook? I join in with the rest -- huh? I read your blog daily, my reason? With all the crap going on in the world on a daily basis, your blog makes me smile, and that's a good thing. Thank you from Canada. As always Farmgirl...You never cease to amaze me. We know you were out in the field with the sheep, but are you just pulling the wool over our eyes with the tale of bagging deer with a crook? Mind you, nothing would surprise me! I have been receiving your blogs for some time now.They have been such an encouragement and inspiration. I look forward to all of the farm photos every day. For I too would like to live on acreage, animals, grow my own food and LIVE the COUNTRY LIFE!!!! I have never posted a response. I had to this time. I'm with all the others who have said,"WHAT? A shepherds crook and Cary's bottle?" No way. My husband even wants to know how you did it. LOLOL! I would have responded sooner, but I was enjoying your bemused and befuddled comments too much to spoil the fun. Now, I don't think I should reveal all my hunting secrets--that wouldn't leave any of the mystery for you. I will, however, mention that not long ago my pal KitchenMage was telling me about a discussion that went on at a writer's conference she had recently attended. The subject? Truth versus a good story. RE: Fg: The subject? Truth versus a good story. Or, as Ruth Reichel put it in her autobiography, Tender to the Bone, "while everything she tells us about is true, it may not be entirely factual." i envy those greens. i should try it out considering i crave perfectly tender leaves all year. but then again, i kill mint and wouldn't want to relegate such beautiful things to a nasty fate. That's why I have wonderful gardening friends :) you're quite talented, enjoy the greens!